Morag has worked in health services research for over 25 years, predominantly in the field of palliative and supportive care. A graduate nurse by background (King’s College London), she holds a Masters in Medical Sociology (Royal Holloway & Bedford New College) and PhD (QMUL) on the definition and measurement of quality of life in older people. She has worked for health authorities in London, and within the universities of London, Manchester and Cambridge on series of research projects including service evaluations (e.g. practice nurses, paediatric A&E, midwifery teams and breathlessness interventions), studies of patient and carer experiences (e.g. in old age, advanced cancer and non-malignant diseases, and breathlessness in advanced disease) and the development of interventions (e.g. in advanced cancer and non-malignant diseases, and breathlessness in advanced disease). Morag’s substantive post is at University of East Anglia (UEA) where she holds a Senior Lectureship. 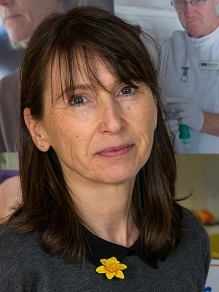 Morag’s research interests include supportive and palliative care (particularly in non-malignant disease), breathlessness in advanced disease, informal carers, quality of life, older people, service evaluation, and methodology – particularly the development and testing of interventions (including randomised controlled trials in palliative care settings) and the use of mixed methods (integrating applied qualitative and quantitative methods where relevant to answer research questions). Morag has a teaching role at UEA (undergraduate and postgraduate), has taught research methods at both undergraduate (University of Manchester) and postgraduate levels (University of Cambridge), and postgraduate supervision experience at both Masters (as sole supervisor) and PhD level (co-supervision). She has hosted medical students for Student Selected Component projects. In addition, Morag is an external examiner for King’s College London MSc Palliative Care. Ewing G, Penfold C, Benson J, Mahadeva R, Howson S, Burkin J, Booth S, Lovick R, Gilligan D, Todd C, Farquhar M. Clinicians’ views of educational interventions for carers of patients with breathlessness due to advanced disease: findings from an online survey. Journal of Pain & Symptom Management 2017;55(2):265-271. Farquhar M, Prevost AT, McCrone P, Brafman-Price B, Bentley A, Higginson IJ, Todd C, Booth S. The clinical and cost-effectiveness of a Breathlessness Intervention Service for patients with advanced non-malignant disease and their informal carers – mixed findings of a mixed method randomised controlled trial. BMC Trials 2016;17:185. Fleming J & Farquhar M [joint first authors], CC75C study collaboration, Brayne C, Barclay S. Death and the Oldest Old: Attitudes and Preferences for End-of-Life Care – Qualitative Research within a Population-Based Cohort Study. PLoS ONE 2016;11(4):e0150686. Preston NJ, Farquhar MC, Walshe CE, Stevinson C, Ewing G, Calman LA, Burden S, Brown Wilson C, Hopkinson JB, Todd C. Strategies designed to help healthcare professionals to recruit participants to research studies. Cochrane Database of Systematic Reviews 2016, Issue 2. Art. No. : MR000036. DOI: 10.1002/14651858.MR000036.pub2. Currow DC, Abernethy AP, Allcroft P, Banzett RB, Bausewein C, Booth S, Carrieri-Kohlman V, Davidson P, Disler R, Donesky D, Dudgeon D, Ekstrom M, Farquhar M, Higginson I, Janssen D, Jensen D, Jolley C, Krajnik M, Laveneziana P, McDonald C, Maddocks M, Morelot-Panzini C, Moxham J, Mularski RA, Noble S, O’Donnell D, Parshall MB, Pattinson K, Phillips J, Ross J, Schwartzstein RM, Similowski T, Simon ST, Smith T, Wells A, Yates P, Yorke J, Johnson MJ. The need to research refractory breathlessness. European Respiratory Journal 2016 Jan;47(1):342-3. Javadzadeh S, Chowienczyk S, Booth S, Farquhar MC. Comparison of respiratory health-related quality of life in patients with intractable breathlessness due to advanced cancer or advanced COPD. BMJ Supportive & Palliative Care 2016;6:105-8. Ewing G, Ngwenya N, Benson J, Giiligan D, Bailey S, Seymour J, Farquhar M. Sharing news of a lung cancer diagnosis with adult family members and friends: a qualitative study to inform a supportive intervention in cancer care. Patient Education and Counseling 2016 Mar;99(3):378-85. Chin C, Butcher HH, Spathis A, Ryan R, Johnson M, Pattinson K, Currow D, Banzett R, Yorke J, Clayson H, Macnaughton J, Penfold C, Farquhar M, Booth S. What’s trending in breathlessness research? Proceedings of the 8th Annual Meeting of the Breathlessness Research Interest Group. Progress in Palliative Care 2015;23(6):326-30.